In order to evaluate whether the Go Los Angeles Card is a good deal, we put together some sample itineraries of things you could reasonably accomplish in the time allowed for the 3, 5, and 7 day Go Los Angeles Cards. You could also pick any single day of activities to do with a 1 day card, or pick 2 days to use with a 2-day card. There are many other worthy activities included with the Go Los Angeles Card, but we chose ones that would maximize savings, while allowing you enough time to enjoy the attractions. With the 7-day cards, for example, you may already have made the purchase price back by day 5 and may choose to spend a card day on a $10 museum rather than worrying about milking it to the max. Since the multi-day cards do not have to be used on consecutive days, it makes sense to plan days at the beach, by the pool, doing free or inexpensive activities, or other activities that are not included in the card (like Disneyland) on days in between your card use days so you don't burn out. The 3, 5, and 7 Day Go Los Angeles Cards go on sale pretty regularly for a few days a month for 10% off and once or twice a year for 15% off. Note: The prices used are the full prices at time of writing. Prices change constantly, both increasing and going on sale, so check prices before you go. The overall savings with the card remain pretty consistent. If you don't need to ride every ride at Universal Studios Hollywood, you can take the Warner Bros Studio Tour ($49) in the morning and spend the afternoon and evening (until 9 pm in summer) at Universal Studios and CityWalk. Note: Sony only offers tours on week days. 1:45 - 4:30 Hollywood Museum - check out the movie memorabilia collection in the old Max Factor building ($15). Note: Hollywood Museum is closed Mondays and Tuesdays. Note: The Go Los Angeles Card is only accepted until 5:30 pm, but the museum is open later, so as long as you're in before 5:30, you can stay until close. Note: This is a really long day on your feet, but they eliminated the tours that would have allowed you to split the day between walking and sitting. Alternately, if you don't do the Warner Bros Tour on Day 2, you could plug that in instead of morning or afternoon activities on Day 3 to get you off your feet for a bit. It's a 2 hour and 15-minute tour, with the last departure at 4 pm. Total at full price: $305.95 for the most expensive choices. With the regular price GLA Card at $189.99, you save $115.96. Note: Prices are estimates only. Attractions included in the card are subject to change. Conclusion: Not every option is a good one for saving money. Really look at what you want to do. The 7-Day Go Los Angeles Card gives you 14 days to complete your 7 days of activities, so if you have a longer visit, you can plan down time at the beach or pool between hectic days. You can also schedule in things that are free all the time, like the California Science Center. Day Total: $62.90, $47.90, Using discount combo available for Aquarium+Queen Mary $42, $23, plus the cruise is $54, $35 for the day. You could save more if you did all four theme parks and skip the museum day, or do California Science Center for free on a non-card day. This itinerary is designed to maximize savings by including the most expensive attractions on card days and leaving less expensive options that are great, but don't maximize savings and can be purchased individually at a better value than using a card day. It is laid out as a 7-Day Itinerary, but you can pick any 1 to 3 days that average more than $65 per day, or any 5 days that average more than $50 per day to save money with the Go Los Angeles Card. 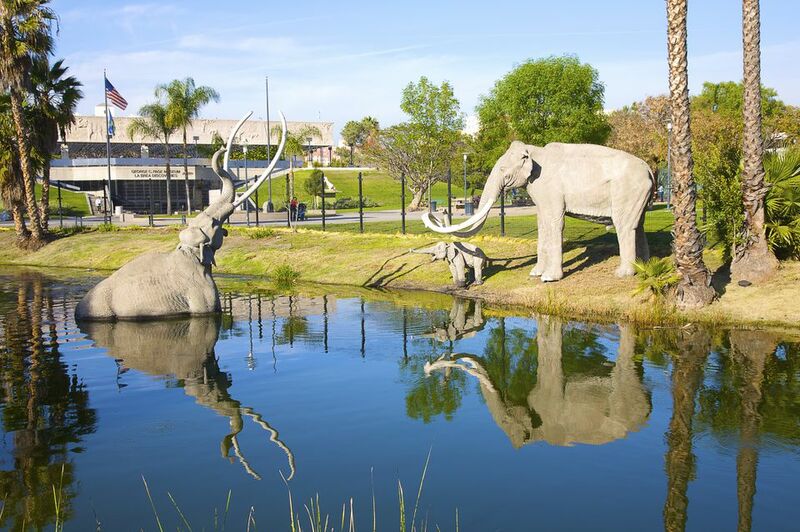 2:15 pm - Page Museum at the La Brea Tar Pits ($12) to see the mammoths and saber-tooth cats unearthed in the tar pits. Alternately, spend the whole afternoon at the Huntington Library and Gardens near Pasadena($20), or try to squeeze in both the LA Zoo ($16) and a visit to the Autry Center ($9) before 5 pm. Check for later hours in summer. 10 am Hollywood Museum - check out the movie memorabilia collection in the old Max Factor building ($15). Day Total: $62.90 full price, Using discount combo available for Aquarium+Queen Mary $42, plus the cruise is $54 discounted total for the day without the card. Note 1: Sony only offers tours on weekdays.